phpBB Forum is now integrated with AutoTweet and Joocial! Thanks to AlterBrains' p8pBB bridge, the #1 free, open source bulletin board software is integrated with AutoTweet PRO and Joocial on Joomla CMS! phpBB is a free flat-forum bulletin board software solution that can be used to stay in touch with a group of people or can power your entire website. On Joomla! 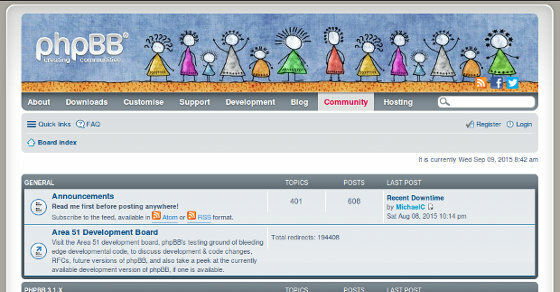 CMS, AlterBrains' p8pBB bridge is a complete bi-directional integration of phpBB forum. Forum is displayed inside Joomla! template as usual component. And now, AutoTweet PRO and Joocial are integrated to automate and publish phpBB Topics and Posts to Facebook, Twitter, LinkedIn and more. Simply, AutoTweet PRO or Joocial publish from phpBB to social networks. The new "AutotweetP8pbb bridge for phpBB forum" plugin is already available in the latest AutoTweetNG PRO and Joocial 7.9.5 or 8.0.6 Beta. Our customers can get a discount coupon for AlterBrains' p8pBB bridge (please, contact us to receive the coupon). Stay up to date and join the mailing list to get the newest articles!